Airplanes have had an increasingly hard time navigating since Planet X, aka Nibiru arrived in the inner solar system in 2003. First noticed was that the compass is no longer reliable. Then GPS became unreliable. The North Pole is shifting. More specifically, the earth’s magnetic field is ever changing, just slightly. It’s that shifting that has forced Tampa International Airport to repaint all its runways so that the numbers on them accurately reflect the compass headings they’re supposed to represent. ZetaTalk Explanation 1/18/2014: Air navigation has been having increasing problems since 2003, when the magnetic bully Planet X arrived in the inner solar system. First the compass became erratic, pointing toward Siberia as the magnetic N Pole instead of its established location north of Canada. Airports responded by painting directions on their runways, a fact which hit the press. Other guidance systems – radar and GPS – were relied upon. But radar merely tells you where the ground or large objects lie, and if the terrain is similar to that expected. A wrong location would pass notice. 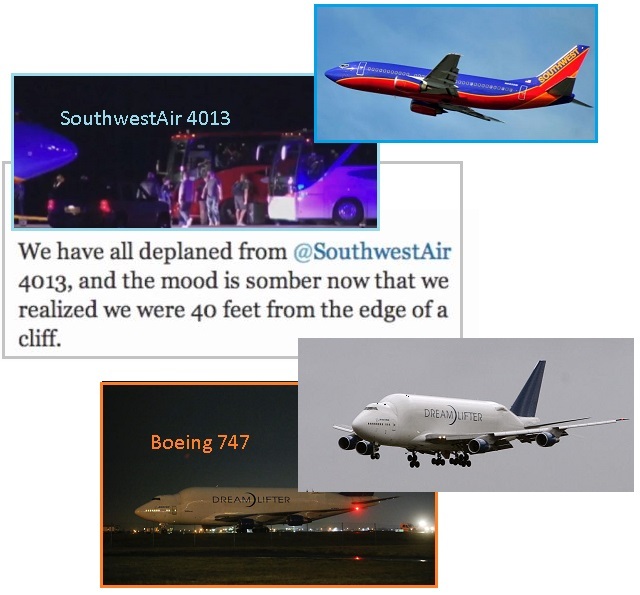 Now the wobble has gotten so bad that big airliners are landing too far to the north in Missouri and Kansas! Note that both these airliners were misdirected at night, when the Earth wobble in N America would have a similar impact. Both also about 9 miles too far to the north. This cannot be a coincidence. It is, in fact, proof of the Earth wobble! A Southwest Airlines Boeing 737 landed at the wrong airport on Sunday, stranding its passengers in Hollister, Mo. It is unclear why the airplane, which was headed for nearby Branson, Mo., touched down at an airport 9 miles away from its intended destination, but it appears it will stay there for a while, since the 3,700-ft. (1,130 m) runway is not sufficiently long for the Boeing jet to take off. It's the second time in less than two months that a large jet has landed at the wrong airport. In November, a Boeing 747 that was supposed to deliver parts to McConnell Air Force Base in Wichita, Kan., landed 9 miles north at Col. James Jabara Airport. The pilot of a Boeing 747 jumbo jet mistakenly landed at a small Kansas airport not far from the Air Force base where it was supposed to deliver parts for the company's new 787 Dreamliner. The 747 intended to touch down at McConnell Air Force Base in Wichita, which is next to a company that makes large sections of the 787. Instead, the cargo flight landed 8 miles north, at the smaller Col. James Jabara Airport. ZetaTalk Explanation 1/18/2014: GPS has been faltering due to the wobble. Where the GPS satellites are mostly dragged along with the globe, as the atmosphere tends to cling to the Earth beneath it, a more violent wobble will put the satellites out of position for a period of time. It is notable that two such errant landings have happened lately in the same vicinity, both times planes landing 9 miles north of where expected. The globe returns to its prior position during the wobble, so, as the saying goes, even a broken clock is right once a day. The solution is to add more identifiers on airport landing strips that can be seen from above, and perhaps to fly only during the day.